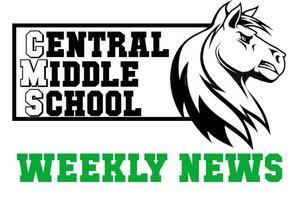 This week I would like to highlight our amazing music program at Central. We are lucky enough to have great music in our schools here in San Carlos. Furthermore, we are exceptionally blessed that our students are being recognized on the state level. This year we had three students from Central selected for the All State Junior High Jazz Band: Jackson Bae (trumpet), Trent Haithcox (guitar), and Helena Landels (trombone). The band is featured at the California All State Music Education Conference and will be lead by guest director, Les Nunes, renown jazz educator, composer, and arranger that teaches in Clovis, CA. This band, because of its size, is the most competitive honor band group for which students audition. Central is only one of two schools that have multiple students from the same school (the other... San Carlos' very own Tierra Linda MS!) and and the highest number of students from one school. To be selected for this very competitive group is a high honor. To have 3 students selected is truly a blessing. Let's celebrate this momentous occasion for Central's music program! Thank you to Nick Garcia and Colyn Fischer for the amazing work they do with our children. CMS has 7 spots available for the 21st Annual MIDDLE SCHOOL Teens Tackle Tobacco, Alcohol, Drugs & Youth Wellness Conference. This conference will be filled with fun, hands-on, opportunities for youth and adults to share best practices regarding positive youth development, peer education, leadership, and many other youth empowering topics. Please contact Ms. Jobak at jjobak@scsdk8.org if you are interested in having your child attend this great event. We have some 6th graders who are doing a ROPES project that donates new or gently used soccer gear to underprivileged children. Items to donate are shin guards, cleats, jerseys, shorts, bags, and anything else that would be used to practice or play soccer. Please wash the clothes prior to donating. The deadline to drop off is Friday. the 25th. We also have a donation barrel for Second Harvest Food Bank in the main office. This time of year, after the holidays, is when the need for food donations is the greatest. Hunger rates sore in January and February. Please consider donating some non-perishable food. Are you interested in having your child attend a small, diverse, personalized, college preparatory high school? We are proud to report that 100% of Summit graduates were accepted into a 4-year college last year, continuing a long tradition of excellence. Please come learn more at our Open House on Saturday, Jan. 19th at 10 am at Everest (455 5th Ave, Redwood City). Additionally, the application for next school year is now live! If you have a current 8th grader who would like to apply to attend Summit Prep for the 2019-20 school year, please visit the "Enroll" page of our summitprep.summitps.org website. Enjoy an adult night out. Dance, have some fun, support your schools and make some memories! Join parents and friends across the district at the annual SCEF Starlight Gala. It is a fabulous night of dinner, dancing and auctions. Get excited to see all the fun and creative ways our teachers have cooked up to support SCEF with your kids! Details to follow. Mary Poppins Jr. opens this Thursday! Do you have your tickets? Treat the family to two hours of magic and fun this week with a performance of Mary Poppins Jr., presented by San Carlos Children’s Theater! Featuring a delightful cast of 4th-8th graders from the San Carlos School District, this shortened version of the Broadway hit runs January 24-27 in Mustang Hall on the Central Middle School Campus. Everyone loves Mary Poppins so be sure to reserve your seats in advance at www.SanCarlosChildrensTheater.com.